Late September sees a rather busy schedule of new movies as we start to transition into the prestige part of the movie schedule. At least one of this weekend's new films has a decent shot of being remembered come Oscar time, but it's also marked by a potential blockbuster sequel for an unlikely family franchise. 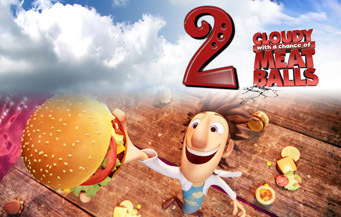 Cloudy With a Chance of Meatballs 2 is one of those phrases that probably shouldn't even exist, given that it indicates a sequel to a relatively thin children's book that wasn't all that well known in the first place exists, and with only medium-level voice talent to boot. But, and here's the crucial part, it was actually good and/or tolerable for parents, which is the secret real audience for family films. After bringing in $124 million, Sony scrambled to find some more story for this budding franchise about food brought to life and awkward romance amongst that. All the major voices return for the sequel, which includes Bill Hader, Anna Faris, Benjamin Bratt, Neil Patrick Harris and James Caan, though Mr. T has been replaced by Terry Crews, in what's a worst a lateral move. More concerning is that Phil Lord and Chris Miller, the brainchildren behind the first film, have moved on to live action movies and TV producing. The new directing team are relative rookies, with direct-to-DVD sequels and animation department credits for the most part. While I presume that Hader and Faris' characters resume their bizarre courtship, the story here seems to be a sort of Jurassic Park-like journey to a land of sentient food, which conveniently takes on the characteristics of the animal whose name it most sounds like. ALL THE FOOD PUNS! Can this sustain a 90 minute movie? Maybe? The ads here are not all that promising, but the phrase “benefit of the doubt” would seem to apply here. This should see a decent improvement from the $30 million opening of the first film to around $45 million this weekend.